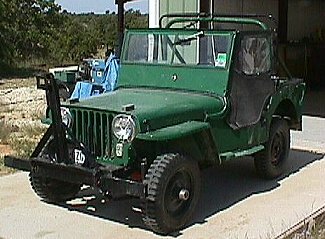 "I have just purchased the CJ-2A shown in the attached photograph. The gentleman that sold it to me represented the vehicle as a 1946 model--which is in agreement with the paper title issued by the State of Texas. The paper title has the vehicle serial number as T206764 and it is identified as "MILI" (military??) 1946. The i.d.tag on the firewall under the hood-passenger side--has the serial number 116311. I am unable to find any evidence of a serial number plate on the frame horn. IF the serial number on the tag is correct, then this vehicle would have been manufactured in mid 1947."